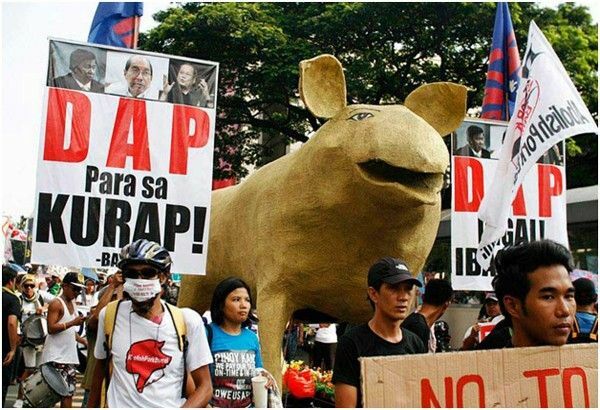 !n this file photo from 2013, activists protest the Disbursement Acceleration Program, which was likened to the use of "pork barrel" funds. MANILA, Philippines — More of former President Benigno Aquino III's allies should face charges over the Disbursement Acceleration Program (DAP), Malacañang said Thursday, as it accused the Office of the Ombudsman of favoring personalities tied to the previous administration. Presidential spokesman Harry Roque claimed President Rodrigo Duterte has documents that show that Ombudsman Conchita Carpio Morales had sat on some of the complaints against officials believed to have benefited from the controversial program. "The complaint — and this did not just come from president — is that those who were charged over the DAP are from the opposition during the time of President Aquino. Many are complaining about selective justice," Roque said in a press briefing. "So I am sure many people who should have been charged have yet to be charged and that was what the president meant when he said he has documents. These are allies of the previous administration who have not been charged," he added. Ombudsman Conchita Carpio-Morales has recommended the filing of charges against Aquino and former Budget Secretary Florencio Abad over the DAP, which was allegedly used to bribe senators into convicting the Chief Justice Renato Corona in 2012. The ombudsman found probable cause to charge the former president with usurpation of legislative powers, which is punishable with imprisonment ranging from six months and one day to six years. The Budget department under Abad had allowed the withdrawal of P72 billion worth of unobligated funds of government agencies under the executive department. Officials of the previous administration claimed the disbursement was meant to spur economic activity. Some acts under the DAP have been declared unconstitutional by the Supreme Court for going against the constitutional doctrine of separation of powers. Declared unconstitutional were the cross-border transfers of savings of the executive to augment funds of agencies outside the department and the withdrawal of unobligated allotments from implementing agencies and their use as savings before the end of a fiscal year. The Liberal Party, Aquino's political party, has defended the implementation of DAP, saying the program sought to "deliver the services and infrastructure needed by the people" and was "guided by the laws available to the executive." Roque welcomed Aquino's indictment but questioned the time it took for the decision to come out. "We welcome, of course any effort to bring about accountability of public officers. However, if you will recall I was the one who argued at the Supreme Court against the constitutionality of DAP. Of course, I personally am asking why it took all this time before anyone could be charged with DAP," he said. "I think it's been over four years since a decision came out." Last Wednesday, Duterte accused the ombudsman of not acting on some of the DAP-related complaints. during a gathering of councilors in Iloilo City. News reports on complaints related to DAP list Aquino and Abad as the respondents. The claim of "selective justice" meanwhile has been frequently used by senators implicated and charged over the so-called Pork Barrel Scam, where Priority Development Assistance Fund allocations were allegedly given to non-existent foundations for non-existent projects. "I will publish it, There's a new one, after she exits," Duterte added Wednesday. Morales, an appointee of Aquino, is set to retire on July 26. Roque said some quarters are also asking why the ombudsman only recommended charges of usurpation of legislative powers. "The original complaint was for malversation (of public funds). But nonetheless, the position of the Palace is it is the call of the ombudsman as a constitional office to file these charges and we are still nonetheless pleased that again the ombudsman has filed information to bring about accountability even from one who was the highest officer of the land, former President Noynoy Aquino," he said. Asked whether he thinks the case against Aquino is weak, Roque replied: "I could only surmise there was no personal benefit so they filed usurpation (of legislative powers)." "But perhaps they should have considered the fact that personal benefit may not just refer to funds that went to one's personal pocket. It may also refer to, as claimed by former Senator Jinggoy Estrada, funds used to buy votes for the impeachment. For me, that aspect should have been considered. But it's the call of the Omdbudsman as we all know," he added. Estrada first mentioned the DAP funds in a privilege speech at the Senate in 2013, saying those who voted to convict Corona received an additional P50-million allocatiion for projects. The senator, who voted to convict Corona, also said then that the money was "not a bribe. It was never a bribe. Kung baga walang suhol." Roque, a former lawmaker, said members of Congress no longer receive DAP and pork barrel funds under Duterte. "The allies of the (previous) administration were really favored, especially in Congress...I can attest to a fact the system stopped under the administration of President Duterte," the presidential spokesman said.